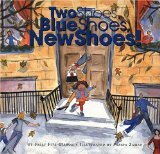 Two Shoes, Blue Shoes, New Shoes – These Shoes Really Dance! Wearing new blue shoes to school, our happy heroine bounces through city streets with great enthusiasm. Delightful watercolor illustrations exude energy and compliment the simple, rhyming text beautifully. See him splash his tail, shoes! Best for children aged three to six.